A home is a place to relax yourself and dump away all your negativity behind, with all the frigid hassle on weekdays, weekends are the best time to be spent indoors. Hence, coziness in your Bandar Sri Damansara newly bought home is the key for escaping from your tense week. You may have the impression of coziness like sitting near a fireplace with your favourite person, warm socks on your feet and drinking cocoa with s’mores; however a fireplace is not applicable in tropical countries such as Malaysia. However, you may achieve this coziness using lighting in your home. Bright, white lights may boost your productivity in workplace but in home it might stress you out. Yellow and dim lights can boost the coziness and make you space warmer. You may also swap alternatives to candles or table lamps for a comforting feel. If you are worried with flames in the house, you may use a battery-operating candle to prevent any fire breakouts. Additionally, you may make use of string lights in your home too. For a starry look in your bedroom, lightweight LED string lights behind your translucent drapes may enhance your sleeping quality. You also may use string lights under your cabinet to prevent any accidents while navigating in the dark. String lights also come in handy when you need to accent the spotlight of your hanging décor in your home. If you would like a fancy table lamp, you may put some string lights in a jar or an old lantern to create an artsy lamp. A slight green is always good for a cozy home as they bring liveliness and freshness to your space. Greenery in your home may bring positivity to you such as walking down in a pine forest. You may include plants into your home décor by placing them on your floating shelves with your books or accessories to create a fresh and comforting look after a long reading. You may include some plants in your bathroom too by mounting them into your stones or wood accent bathroom walls. Ferns are a suitable choice in a bathroom. In the kitchen, you may place some little cactus, spice or tomato plants on the rack underneath your kitchen window. This may come in handy when you need a little spice leaves in your cooking. Flowers in your living space also a good aromatherapy option if you are not into scented candles and need a natural scent. You may have some flowers which give a strong yet comforting smells such as lavender and lemongrass in your living room to keep it fresh from time to time. Colourful flowers such as daisies and tulips also may add a little colour to your living space. What feels better than soft jazz or soul music in a cosy living room at night with your beloved ones? Music in the air always accent the coziness in a space. With a good stereo system and soft music, you may relax your tired soul after a long day at work. Soft jazz or instrumental music are always the best choice to accent the atmosphere in the room. Bear in mind that the music shouldn’t be too loud to disrupt conversation in the room while you mingle with your guests or family members, also do not be afraid o explore more musical genre to create different atmosphere. Most of us enjoy a soft yet warm blanket in a comfy bed that enhance our sleeping quality. You may have decorative pillows on your sofa too add some colours and comfort to your dull living room, also creating the impression of coziness using warm plaid made of natural wool. If you would not like cold feet on your floor, you may have a choice of your own rug on the floor to change the feeling of your space. A fluffy rug which favoured by people who likes a joy of fluffiness; natural fibre rugs can bring a little more classy to your space. 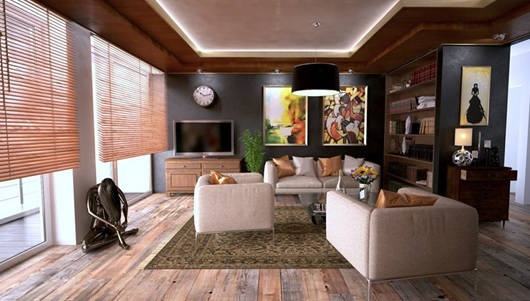 You may also add crochet or knitted rugs on your coffee table to create the warm atmosphere in your living room. For curtains and drapes, there are variations of fabrics choices to achieve your desired looks in you rooms. Translucent fabrics may create a soft light into the room daytime without sunlight shines too much into your room making you stress; UV or sunlight cancelling drapes for those who like a dark room to sleep in during the weekends or holidays, and lastly some colourful drapes bring liveliness to the room.